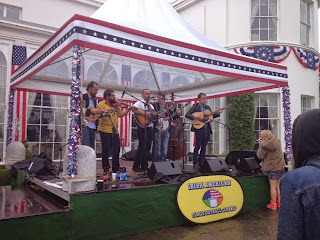 Last Friday was the 4th of July, my first in Dublin. U.S. Embassies all over the world have Independence Day events, though they vary in size and style depending on the size of the embassy, the resources available, the tastes of the ambassador, and local conditions in the host country. In Conakry we held our 4th of July party in May to escape the worst of the summer monsoon. The event itself was a cocktail party for maybe 200 guests, differing from other such diplomatic events primarily by the national anthem performance at the beginning and a triumphant shower of red, white, and blue confetti at the end. We also had a booth where guests could take a photo with a cardboard cutout of President Obama, which proved very popular. Things are a little different in Dublin. As in the previous four years, this year's event was a 3,000-guest extravaganza held on the grounds of Deerfield, the official residence of the U.S. Ambassador. The place is huge, big enough to comfortably fit a football field in the backyard. This is handy because the main focus of the event is an American flag football game, with teams made up of a motley mix of embassy staff and professional rugby and Gaelic football players. The official game ball was delivered to the field by a parachute team jumping from a plane overhead. There was a halftime show and a post-game show. There was also a KidZone full of face painting and video games and bouncy castles. And food and drinks of course: burgers and corn dogs and popcorn and cotton candy and coffee and beer and bourbon, all American-sourced, naturally. It was An Event. I didn't get many photos, but there are tons on the embassy Flickr feed if you're interested. I missed most of the excitement as I was on shuttle bus duty for the first half of the festivities; a party like this doesn't throw itself. It was certainly on a whole other scale from any embassy event I've ever been to before, but it was still fundamentally a work function and I wasn't that excited about it. But I brought my friend Sean, who's not a diplomat and doesn't do this for a living. I go out to the residence semi-regularly, but he'd never been before and saw it with fresh eyes. For me the party - though fun in its own right - was something I was compelled to go for work; for him it was a sought-after invitation to an exclusive event he would never otherwise get to go to, and an occasion to make all his other American friends jealous. Perspective!